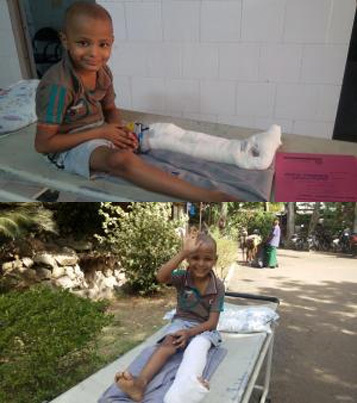 A 9 year old boy, having developed cancer in his left leg-bone (tibia), came to KCHRC. He was first given Chemo therapy followed by a "Limb Salvage Surgery" in which the cancerous bone was cut, removed from the body and sent to radiotherapy (RT) department. The bone was given a very high dose of radiation to kill all the tumorous cells. To put in perspective, during a normal RT session, 1.5-2 Gy of radiation is given, whereas the cancerous bone was given 50 Gy of radiation in a single fraction. This process killed all the cancerous cells in the bone. After RT session, the same bone was sent back to the OT where the boy was under anesthesia. The bone was reimplanted and the boy was discharged after a week of observation. Six weeks of physio therapy gave the boy the ability to walk normally again. The boy hailed form a poor family and was 100% financially supported by MSA and Indian Cancer Society – Cancer Cure Fund (ICS-CCF). This is a very complex surgery requiring simultaneous support of surgical oncologist, orthopedic surgeon, RT oncologist and anesthesiologist. It requires state-of-the-art medical equipment, so very few centers in India can perform this complex surgery. We are proud to have superior skills and equipment which enables us to perform this type of complex procedures to benefit the society.